SQL Database automatically creates database backups that are kept between 7 and 35 days, and uses Azure read-access geo-redundant storage (RA-GRS) to ensure that they are preserved even if the data center is unavailable. These backups are created automatically and at no additional charge. You don't need to do anything to make them happen and you can change Backup Retention Period. Database backups are an essential part of any business continuity and disaster recovery strategy because they protect your data from accidental corruption or deletion. If your security rules require that your backups are available for an extended period of time (up to 10 years), you can configure a long-term retention. SQL Database uses SQL Server technology to create full, differential, and transaction log backups for the purposes of Point-in-time restore (PITR). The transaction log backups generally occur every 5 - 10 minutes and differential backups generally occur every 12 hours, with the frequency based on the compute size and amount of database activity. Full, differential, and transaction log backups allow you to restore a database to a specific point-in-time to the same server that hosts the database. The backups are stored in RA-GRS storage blobs that are replicated to a paired data center for protection against a data center outage. When you restore a database, the service figures out which full, differential, and transaction log backups need to be restored. Restore a database to a point-in-time within the retention period. This operation will create a new database in the same server as the original database. Restore a deleted database to the time it was deleted or any time within the retention period. The deleted database can only be restored in the same server where the original database was created. Restore a database to another geographical region. Geo-restore allows you to recover from a geographic disaster when you cannot access your server and database. It creates a new database in any existing server anywhere in the world. Restore a database from a specific long-term backup if the database has been configured with a long-term retention policy (LTR). LTR allows you to restore an old version of the database to satisfy a compliance request or to run an old version of the application. For more information, see Long-term retention. To perform a restore, see restore database from backups. In Azure storage, the term replication refers to copying files from one location to another. SQL's database replication refers to keeping multiple secondary databases synchronized with a primary database. Each SQL Database has a default backup retention period between 7 and 35 days that depends on the purchasing model and service tier. You can update the backup retention period for a database on SQL Database server. For more information, see Change Backup Retention Period. If you delete a database, SQL Database will keep the backups in the same way it would for an online database. For example, if you delete a Basic database that has a retention period of seven days, a backup that is four days old is saved for three more days. If you need to keep the backups for longer than the maximum retention period, you can modify the backup properties to add one or more long-term retention periods to your database. For more information, see Long-term retention. If you delete the Azure SQL server that hosts SQL databases, all elastic pools and databases that belong to the server are also deleted and cannot be recovered. You cannot restore a deleted server. But if you configured long-term retention, the backups for the databases with LTR will not be deleted and these databases can be restored. Basic service tier is 1 week. Standard service tier is 5 weeks. Premium service tier is 5 weeks. If you're using the vCore-based purchasing model, the default backup retention period is 7 days (for single, pooled, and instance databases). For all Azure SQL databases (single, pooled, and instance databases, you can change backup retention period up to 35 days. If you reduce the current retention period, all existing backups older than the new retention period are no longer available. If you increase the current retention period, SQL Database will keep the existing backups until the longer retention period is reached. SQL Database supports self-service for point-in-time restore (PITR) by automatically creating full backup, differential backups, and transaction log backups. Full database backups are created weekly, differential database backups are generally created every 12 hours, and transaction log backups are generally created every 5 - 10 minutes, with the frequency based on the compute size and amount of database activity. The first full backup is scheduled immediately after a database is created. It usually completes within 30 minutes, but it can take longer when the database is of a significant size. For example, the initial backup can take longer on a restored database or a database copy. After the first full backup, all further backups are scheduled automatically and managed silently in the background. The exact timing of all database backups is determined by the SQL Database service as it balances the overall system workload. You cannot change or disable the backup jobs. Single and pooled databases offer the option of configuring long-term retention (LTR) of full backups for up to 10 years in Azure Blob storage. If LTR policy is enabled, the weekly full backups are automatically copied to a different RA-GRS storage container. To meet different compliance requirement, you can select different retention periods for weekly, monthly and/or yearly backups. The storage consumption depends on the selected frequency of backups and the retention period(s). You can use the LTR pricing calculator to estimate the cost of LTR storage. Like PITR, the LTR backups are geo-redundant and protected by Azure Storage cross-regional replication. For more information, see Long-term backup retention. If your database is encrypted with TDE, the backups are automatically encrypted at rest, including LTR backups. When TDE is enabled for an Azure SQL database, backups are also encrypted. All new Azure SQL databases are configured with TDE enabled by default. For more information on TDE, see Transparent Data Encryption with Azure SQL Database. On an ongoing basis, the Azure SQL Database engineering team automatically tests the restore of automated database backups of databases across the service. Upon restore, databases also receive integrity checks using DBCC CHECKDB. Any issues found during the integrity check will result in an alert to the engineering team. For more information about data integrity in Azure SQL Database, see Data Integrity in Azure SQL Database. When you migrate your database from a DTU-based service tier with the default PITR retention of 35 days, to a vCore-based service tier, the PITR retention is preserved to ensure that your application's data recovery policy is not compromised. If the default retention doesn't meet your compliance requirements, you can change the PITR retention period using PowerShell or REST API. See Change Backup Retention Period for more details. You can change the default PITR backup retention period using the Azure portal, PowerShell, or the REST API. The supported values are: 7, 14, 21, 28 or 35 days. The following examples illustrate how to change PITR retention to 28 days. These APIs will only impact the PITR retention period. If you configured LTR for your database, it will not be impacted. For more information about how to change the LTR retention period(s), see Long-term retention. To change the PITR backup retention period using the Azure portal, navigate to the server object whose retention period you wish to change within the portal and then select the appropriate option based on which server object you're modifying. For more information, see Backup Retention REST API. Database backups are an essential part of any business continuity and disaster recovery strategy because they protect your data from accidental corruption or deletion. To learn about the other Azure SQL Database business continuity solutions, see Business continuity overview. To restore to a point in time using the Azure portal, see restore database to a point in time using the Azure portal. To restore to a point in time using PowerShell, see restore database to a point in time using PowerShell. To configure, manage, and restore from long-term retention of automated backups in Azure Blob storage using the Azure portal, see Manage long-term backup retention using the Azure portal. 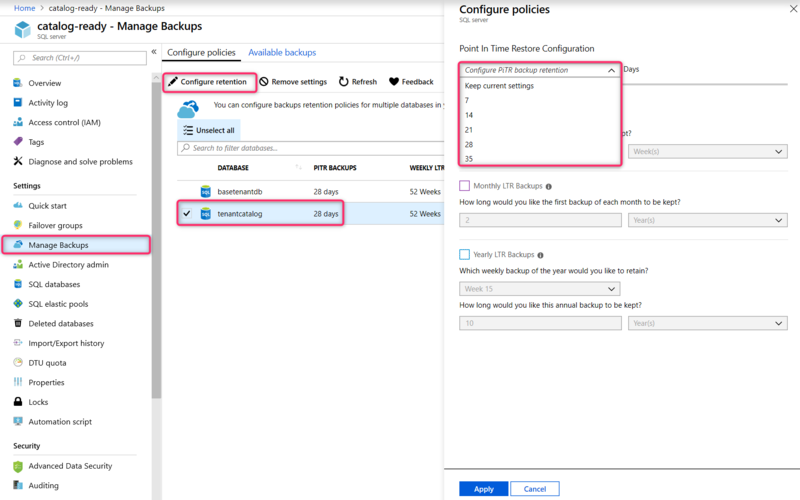 To configure, manage, and restore from long-term retention of automated backups in Azure Blob storage using PowerShell, see Manage long-term backup retention using PowerShell.